“You already know how the unending emphasis on 'the standards' takes up a disproportionate amount of classroom time that could be much better spent,” she said. Oconee County School Superintendent Jason Branch had raised just those concerns back in December of 2015 in a prelegislative session with Oconee County’s delegation to the General Assembly. Sen. Bill Cowsert, who was at that session, sponsored legislation the following February that, when signed by Gov. Nathan Deal, decreased the dependence on test scores in teacher assessments, eliminated some testing, and moved some testing to the end of the school year. 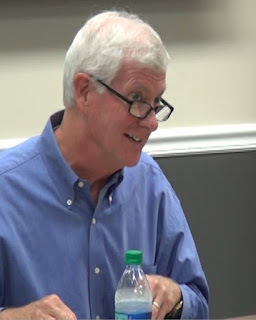 Board of Education Chair Tom Odom said before Reifsteck spoke that “generally, there will be no response to comments or questions posed by citizens at this meeting,” and neither Branch nor any member of the Board mentioned Cowsert’s legislation or Branch’s role in shaping it. “I don’t need to recite a bunch of statistics to you about kids,” Reifsteck told the Board at its Sept. 17 meeting. “You were all kids before. You know, first hand, what it’s like to be a kid. “You know first-hand what its like to go outside and play at recess. “You know how important it is for kids to go outside, burn off some energy, get some fresh air, and just be able to act like kids for a little while during an unstructured part of a very structured day." Reifsteck said reliance on the state standards “creates undue, unnecessary stress for all our children, especially those with learning disabilities. “The focus on constant testing often leads to isolation and embarrassment for children with learning disabilities, and a lack of recess may have more of an impact on these kids than any other kids,” she said. “You have the power to release Oconee County schoolchildren and teachers from the grips of this ineffective system,” she said. “While parents, as individuals, can contact our lawmakers, you know that as a Board of Education, your words and actions carry far more weight than ours do,” Reifsteck said. The Board of Education allows citizen comment at its regular meetings, though not at its work sessions. Reifsteck had scheduled her comments in advance, so she was allowed five minutes to speak. “All comments and questions will be received and taken under advisement by the Board,” Board Chair Tom Odom told Reifsteck, reading from a policy statement. No one responded to Reifsteck. At the prelegislative on Dec. 21, 2015, Superintendent Branch told the legislators he hoped the state will relieve local schools of some of the required standardized tests. Branch said the state-mandated Student Learning Objective Assessments took 15 days away from instruction at the high school level alone. The legislators were receptive to the request but said they were cautious of getting too involved in the day-to-day management of schools. Cowsert introduced his bill, cosponsored with five others, on Feb. 10, 2016. Some of the provisions of the bill were effective on July 1, 2016, and others were delayed until the 2017-2018 academic year. “Oconee County Schools is very pleased to have been an advocate dating back to 2014 for reducing the number of state-mandated tests to be closer in alignment with the requirements of the Every Student Succeeds Act,” Anisa Sullivan Jimenez, director of Communications with Oconee County Schools, told me in an email message on Sept. 20. Every Student Succeeds Act is a federal law passed in 2015. Through Senate Bill 364, Jimenez said, Oconee County Schools were able to eliminate 36,000 Student Learning Objectives assessments in 2016. “This recaptured 40,700 hours of lost instructional time for students, which was the equivalent of 5.5 more hours of instruction per student per year at that time,” she said. The bill reduced state-mandated tests from 32 to 24, Jimenez said, and for Oconee County this was a reduction on average of from 7.3 to 2.4 tests per student. The bill eliminated Student Learnig Objectives statewide “and we are proud to have played a role,” Jimenez said. The video below is of the Board of Education meeting of Sept. 17, 2018. Board Chair Odom called for citizen comment at 23:35 in the video, and Reifsteck began speaking at 24:51. OCO: BOE 9 17 18 from Lee Becker on Vimeo. There's a big difference between testing, which I agree is excessive, and having grade-level standards, which I support. It makes a lot of sense to have state and national standards for what a sixth grader should know in math; people move, so it ensures that the kid goes into seventh grade prepared even if he's changed school systems. That's what common core was about. Excessive testing against that is something different... that's the waste of time and resources, not the state standards themselves. Put your money where your mouth is and get rid of MAP which takes up almost 3 weeks per school year. If you hire good teachers, they will know at what level their students are. who hold some really stout pursestrings. Discipline rates. Race, gender, confused. Graduation rates. Teacher/student ratios. Hours of this, that, & the other. Reasonable content to create a functioning, rational, educated adult? I have attended meetings listened to the parent seek answers from the BOE. It is very discouraging. They will consider the whole of the student and the methods to best educate the student. You way find the candidates that will improve the education system in OC for all students. It is a sad state of affairs that parents speak to a board and receive no reply. If there is a “court ruling” prohibiting them (BOE) from speaking, in meetings to the parents, inform the public. Since the procedure has not been reported or presented at the meeting that leaves a BOC which autocraticly runs meetings. A little communication is needed. I am seriously considering voting for the qualified individuals running against the incumbents. I will definitely be voting for the two candidates running against the incumbents. The BOE needs to assume some independence and stop agreeing to everything the Superintendent says or doesn't say. You are elected to have a voice not to be an echo of another person.